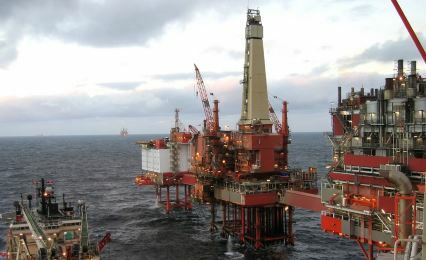 Statoil is a Norwegian oil & gas company and the leading operator on the Norwegian shelf. The company has a high focus on implementing appropriate measures in order to avoid unacceptable consequences. IMPETUS software has been used on numerous occasions to compute the structural response from accidental loadings such as gas explosions and dropped objects. "Many will take the job, just a few are capable"
A methodology was developed to use IMPETUS software for robust predictions of deck response including material failure following dropped object loading. IMPETUS higher-order volume element technology was applied for large-scale structures. Dropped object studies were carried out for deformable containers, pipe baskets, draw works, BOPs and drill collars on various platforms. In the same way, mapping functionality was built into the software to provide import of spatially and time dependent gas explosion loads from other software. Response of module deck from impact of 20ft container. Response of module deck from impact of 20ft container (closer look). Response of main fire partition wall of module following gas explosion loading. The IMPETUS software was extended with a materials library for predicting material failure of steel structures applicable for large-scale analyses. Modelling services were provided and recommended modelling practices for accidental loading of steel structures were developed.